Dehydration is a common occurrence in geriatric populations. These patients are at increased risk for significant adverse events, including but not limited to hypernatremia, encephalopathy, and delirium, as a result of poor fluid intake (Sfera, Cummings, & Osorio, 2016; Shah, Workeneh, & Taffet, 2014). These conditions often require hospitalization, which substantially increases the geriatric population's risk of hospital-associated complications and greatly impacts the economic burden of health care (Pash, Parikh, & Hashemi, 2014). Further, the adverse effects of dehydration may complicate mental status and be of concern in the evaluation and management of psychiatric conditions (Wilson & Morley, 2003). In recognition of these potential harms, an interdisciplinary team at a Veterans Administration Hospital initiated a quality improvement project to assess patient hydration in the geriatric psychiatry unit and implement innovative and timely techniques to encourage fluid intake among geriatric psychiatry inpatients. Proper assessment of fluid status is crucial to understanding the degree of a patient's dehydration; however, psychiatric units have limitations to the extent of laboratory tests and invasive procedures that can be performed. An assessment tool for determining a patient's risk for dehydration may be one solution for this issue (Bulgarelli, 2015). Studies have shown that a correlation exists between laboratory markers of dehydration and geriatric dehydration screening tool scores; however, inclusion of subjective screening items, such as thirst, were found to be of little use (Rodrigues et al., 2015). Studies of the aging brain suggest a reduction of cognition over time, as is demonstrated in geriatric populations, which may lead to reduced subjective experience of dehydration (Sfera et al., 2016). Dehydration assessment tools with high interrater reliability focusing on objective measures of hydration status may be preferable to provide a more accurate representation of dehydration risk in the absence of more in-depth diagnostic measures (Vivanti, Harvey, & Ash, 2010). Encouraging fluid intake in geriatric populations is a challenge due to physiological changes in thirst sensation as well as availability of supportive care to provide easily accessible fluids for consumption, especially while maintaining safety measures of an inpatient psychiatric unit. The Dehydration Recognition In our Elders (DRIE) study suggests older patients have declined ability to conserve bodily fluids; in the study, thirst proved to be a poor indicator of necessity to hydrate, whereas institution of habit and routine in these patients was found to be more effective (Hooper et al., 2015). In a controlled clinical trial of nursing home patients, fluid intake between meals improved significantly in the majority of patients by verbal prompting alone, whereas a minority of patients increased fluid intake in response to beverage preference compliance (Simmons, Alessi, & Schnelle, 2001). The findings suggest that low-cost interventions, such as nursing protocol to offer readily available fluids to geriatric patients and providing some variation in available beverages to meet patient preferences, may offer significant potential to increase fluid consumption in the inpatient setting. The aim of the current project was to implement interventions to increase average daily fluid intake in patients hospitalized in an inpatient geriatric psychiatry unit by an average of at least 125 mL (4.2 ounces) per day within 1 month of intervention initiation. Systematic review suggests that a multifactorial approach toward interventions with emphasis on beverage preference, fluid availability, and staff assistance demonstrates a trend toward increasing fluid intake (Bunn, Jimoh, Wilsher, & Hooper, 2015; Kenney & Chiu, 2001). The researchers focused on implementing measures with a multifaceted approach to address these issues along with assessing fluid intake with an objective hydration assessment tool to compare average fluid intake in geriatric psychiatry inpatients before and after intervention to evaluate the impact of the quality improvement measures. The current study took place within a geriatric psychiatry inpatient setting. Participants were Veterans hospitalized in the geriatric psychiatry unit for 7 or more consecutive days. Other inclusion criteria were age 65 years or older and/or presence of a neurocognitive disorder. Participants were selected sequentially as they were admitted during the observation period. Exclusion criteria included transfer or discharge from the geriatric psychiatry unit prior to 7 days of data collection. Study procedures involved the systematic use of the Oral Hydration Assessment Form (Mentes & Kang, 2011) (Figure 1) among inpatients receiving care in the inpatient service. A multifactorial approach with three components was implemented at the same time and included: (a) offering a flavored drink option of sugar-free flavored lemonade; (b) increasing the size of Styrofoam™ cups available for use in the geriatric psychiatry unit (from 240 mL preintervention to 720 mL); and (c) training nursing staff to encourage fluid intake (while being mindful of fluid restrictions for cardiac and renal patients). Daily oral hydration assessment form used by nursing staff to track fluid intake. Based on information from Mentes and Kang (2011). Note. bpm = beats per minute; UTI = urinary tract infection. Please encourage ∼500 cc of fluid each shift to total 1,500 cc/24-hour period for geriatric patients (we will not include fluid restricted patients); Please provide large Styrofoam cup with new available fluid of sugar-free lemonade (if patient likes this) or water to patient each shift; and Please record fluid intake for each shift on the blue colored Oral Hydration Assessment Form. 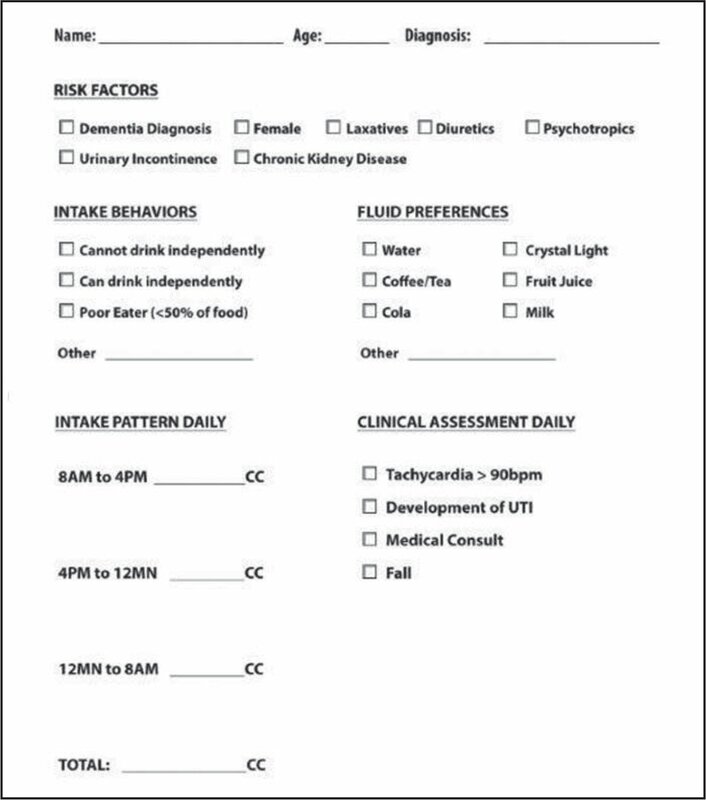 A daily assessment fluid intake form was developed to track patient fluid intake and risk factors for dehydration (Figure 1). Twenty-five patients were assessed using this form over the course of 7 total (not necessarily consecutive) days of hospital stay in the geriatric psychiatry unit prior to implementing intervention measures to constitute the preintervention group. 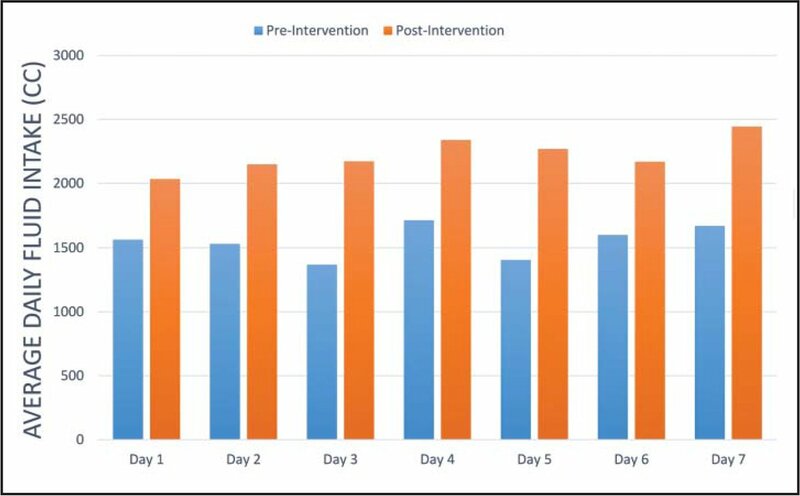 After implementing the changes/interventions outlined above, 25 patients were followed using the daily assessment form for 7 total days each to constitute the postintervention group. The main outcome measured was the average daily fluid intake (in mL) by inpatients. With the assistance of nursing staff, the daily fluid intake of geriatric inpatients was tracked by shift for 7 days. Standardized cups were used to aid in measuring the total volume of fluids consumed. Nurses were trained by the unit dietitian on how to approximate and measure fluid intake based on visual observation of volumes consumed. The daily assessment fluid intake form for each patient was maintained for records to compare and analyze data for the pre- and postintervention groups. There were no ethical concerns in the initiation of this quality improvement project as it included interventions supported by the literature and encouraged normal health practices in a specific population. Patients without cognitive impairment were aware that nursing staff were recording fluid intake, as staff validated fluid intake with them during the shift and at mealtime. Data were collected and analyzed for a total of 50 patients (25 preintervention and 25 postintervention). Demographics were tracked for informational purposes (Table 1). Total daily fluid intake was documented for each patient in the pre- and postintervention groups. Average daily fluid intake was calculated by averaging the fluid intake of all 25 patients in each group based on the numbered day of the study. On average, fluid intake in the postintervention group was higher during each study day compared to the preintervention group (Figure 2). When taken together, the daily average fluid intake of the preintervention group was always less than that of any recorded days of the postintervention group. The adjusted average fluid intake of the preintervention group over the 7-day period was 1,550.51 mL, whereas the adjusted average fluid intake of the postintervention group over the 7-day period was 2,224.81 mL. Average daily fluid intake of geriatric psychiatry inpatients. The results of the current project demonstrate that patients experiencing the three-pronged intervention quality improvement approach had, on average, approximately 700-mL greater daily fluid intake compared to the pre-intervention group. After initial data analysis, the groups were further stratified to assess for population differences, which may have affected the data. One issue with the initial recordings of fluid intake involved staff not recording fluid intake for all three shifts; therefore, the total fluid intake for that day could not be calculated. With familiarity and use of the Oral Hydration Assessment Form, this issue quickly resolved. Overall, the intervention was deemed to be beneficial and worthy of long-term maintenance. Patients with advanced dementia are at particularly high risk for dehydration and benefit from being offered fluids as tolerated if it is not distressing (Arcand, 2015). Although the literature suggests there is a relationship between chronic psychiatric illness and polydipsia, the findings are inconclusive, and it is difficult to attribute differences in fluid intake based on presence of psychiatric disorder alone (Ahmed, High, & Ramachandran, 2001; de Leon, Verghese, Tracy, Josiassen, & Simpson, 1994). Most patients in the current study could drink independently; however, several patients with dementia did not ask staff for fluids, requiring prompting to drink fluids. Some challenges to consider in this quality improvement initiative included potential for bias and inability to provide full consistency of protocol application with nursing staff. During the preintervention group evaluation, some patients showed a trend of increasing fluid intake as the sequential numbered day progressed. At this point, the only change that had been implemented was having nursing staff record total volume intake on the hydration assessment form; therefore, the possibility that nursing staff may have encouraged fluid intake in these patients unconsciously (the Hawthorne effect) must be considered. Another challenge to consider is the lack of continuous presence of the same staff member for fluid intake volume estimation and recording. Nursing staff work on a shift basis, and it was not possible to have the same nurse record data during each shift for the duration of the study period. With consideration of these challenges, data from the postintervention group still show a marked increase in average daily fluid intake compared to preintervention group data. The results of this quality improvement initiative surpassed the researchers' initial aims by a substantial amount. The targeted increase of average daily fluid intake was 125 mL; however, an increase of approximately 700 mL was achieved. Patients reported: “I love the lemonade” and “The [720 mL] cups last the whole shift.” The effect of the three-component method was deemed beneficial for patients and has been continued long term. Nursing staff reported “The big cup helped hydrate patients on psychiatric medications” and “We are busy, and we forget about hydrating patients and the study provided us with a goal to reach at the end of the day.” Since the conclusion of the initial observation period, the geriatric psychiatry unit obtained a pre-mixed flavored beverage (i.e., lemonade) and enhanced water (i.e., calorie-free tropical mango and strawberry kiwi flavored) machine to provide readily available flavored beverages to patients on the psychiatry wards. Subjectively, patients in the initial study, as well as future patients, voiced satisfaction with the flavored beverages and increasingly requested drinks and the larger cups without prompting. Throughout the offering of these fluids, fluid limitations for patients with congestive heart failure and certain renal failure conditions were still followed as per orders (i.e., approximately 1,500 mL per day). The current study was limited by lack of ability to track laboratory markers of dehydration, such as plasma osmolality and serum creatinine, as the benefit of additional needle sticks in the psychiatric unit was deemed inadequate considering the potential harms (e.g., vasovagal reactions, pain and bruising) and lack of routine venipuncture on inpatient wards raising risk for adverse events (Stevenson et al., 2012). Prior studies have shown that physical signs and urine characteristics have poor sensitivity in assessment of dehydration in geriatric patients (Fortes et al., 2015). The researchers also chose not to follow vital signs, as these can have etiologies for abnormalities other than dehydration. In addition, although decreased transfers to inpatient medicine service for complications related to dehydration were considered a potential marker for success, no transfers occurred in any patient included in the project; thus, it was not used as a marker. An additional limitation is the lack of matched pre- and postintervention groups. Due to time and resource constraints, interventions were implemented at a single time point at the inpatient unit level, rather than implemented for each patient during his/her hospitalization. 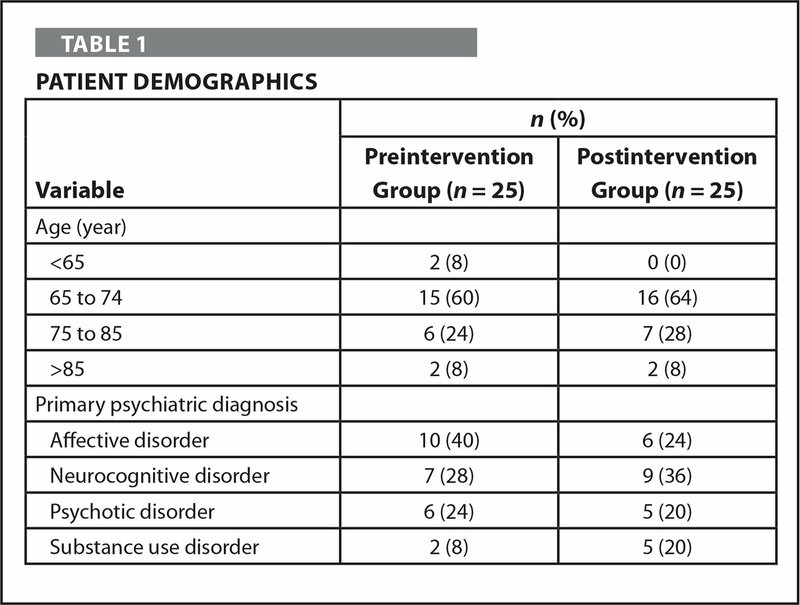 Preintervention patients were discharged when it was clinically appropriate to do so and may not have remained hospitalized during implementation of the interventions. Demographic information was tracked and reported to provide insight into the ages and diagnoses of patients, but this information was not statistically analyzed to identify significant characteristics between groups. Future studies would benefit from randomized matched control and intervention groups to establish causal relationships between the described interventions and their effects on fluid intake. Use of validated dehydration assessments and collection of laboratory data would also be beneficial to identify potential causative factors contributing to dehydration. Additional intervention targets for future research include use of family support and implementation of a behavioral reward system to encourage increased fluid intake. The current quality improvement project focused on a common problem in the geriatric population—suboptimal hydration—which has potential ramifications of worsening or causing additional medical and psychiatric complications, extending hospitalizations, and increasing medical costs. Simple changes (i.e., offering flavored drinks and larger cups) and training nurses to encourage fluid intake allowed nurses to not only meet but surpass the goal of increasing average daily fluid intake by 125 mL, and turned the intervention into a sustainable and translatable process. The buy-in and recognition by nurses of the importance of adequate oral hydration for geriatric patients was invaluable in making the intervention a success. Arcand, M. (2015). End-of-life issues in advanced dementia: Part 2: Management of poor nutritional intake, dehydration, and pneumonia. Canadian Family Physician, 61, 337–341. Bulgarelli, K. (2015). Proposal for the testing of a tool for assessing the risk of dehydration in the elderly patient. Acta Biomedica, 86(Suppl. 2), 134–141. Mentes, J. & Kang, S. (2011). Hydration management evidence-based protocol. Iowa City, IA: John A. Hartford/Csomay Center for Geriatric Nursing Excellence, University of Iowa College of Nursing. Ms. Smith is Inpatient Geriatric Psychiatry Nurse Practitioner, Dr. Velasco is Inpatient Geriatric Psychiatrist, and Dr. Melzer is Assistant Chief Hospitalist, Patient Safety, James A. Haley Veterans' Hospital, Tampa, Florida; Dr. John is Resident Psychiatrist, University of Alabama Birmingham School of Medicine, Birmingham, Alabama; and Dr. Kaufman is Resident Psychiatrist, Zucker Hillside Hospital, Donald and Barbara Zucker School of Medicine at Hofstra Northwell, Glen Oaks, New York. Dr. Melzer is also Assistant Professor, University of South Florida Morsani College of Medicine, Tampa, Florida. The authors have disclosed no potential conflicts of interest, financial or otherwise. This project received formal approval from the U.S. Department of Veterans Affairs (VA) Research Department through their standardized process for quality improvement work. This article is the result of work supported with resources and the use of the facilities at the James A. Haley Veterans' Hospital. The contents do not represent the views of the VA or United States Government. The authors thank the nursing staff in the Geriatric Psychiatry Unit for their dedication to this project and for their excellent care of our Veteran population. Address correspondence to Maureen Smith, ARNP, Inpatient Geriatric Psychiatry Nurse Practitioner, James A. Haley Veterans' Hospital, 13000 Bruce B. Downs Boulevard (116A), Tampa, FL 33612; e-mail: maureen.smith@va.gov.